BacMap is an interactive visual database containing hundreds of fully labeled, zoomable, and searchable maps of bacterial genomes. Maps are available for 2989 bacterial chromosomes across 1,790 bacterial organisms. Each map supports zooming and rotation. Map gene labels are hyperlinked to detailed textual annotations. Maps can be explored manually, or with the help of BacMap's built in text search and BLAST search. A written synopsis of each bacterial species is provided. Several charts illustrating the proteomic and genomic characteristics of each chromosome are available. Gene sequences and protein sequences can be downloaded. Cruz J, Liu Y, Liang Y, Zhou Y, Wilson M, Dennis JJ, Stothard P, Van Domselaar G, Wishart DS. 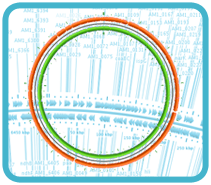 BacMap: an up-to-date electronic atlas of annotated bacterial genomes. Nucleic Acids Res. 2012 Jan;40(Database issue):D599-604.